The last few days I have been online looking for St. Patrick’s Day Printables for Charlee Ann and boy did I hit the jackpot! She is in Kindergarten now and we are really into learning our math and literacy. We have third quarter assessments coming up with some fun ways for Charlee to get a little extra practice. Wait until I tell you why Charlee is afraid of St. Patrick’s Day! 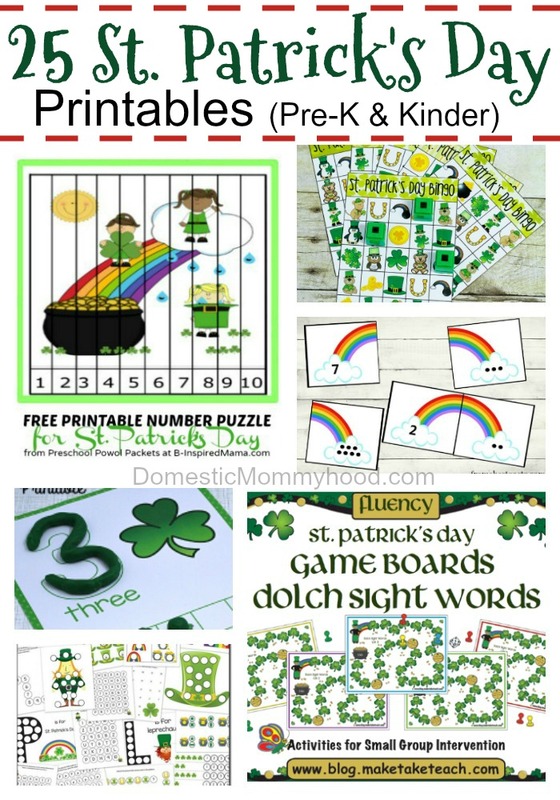 Most of the St. Patrick’s Day Printables can be used for Preschool or Kindergarten and older children would enjoy them as well. She really enjoyed the Play Dough Counting mat (#7) and the Roll a Rainbow Printable (#14). I, on the other hand, was really impressed with the Sight Word Game Board Printable (#4). You will notice that none of Charlee’s favorite had a Leprechaun on them, more about that later. Kindergarten has been a whirlwind of learning as many sight words as we can. If you have a child in Pre-K or Kindergarten you might want to check out these articles for some extra sight word fun! Below you will find the list of St. Patrick’s Day Printables. I hope you enjoy and stick around to find out why Charlee is afraid of St. Patrick’s Day! I guess it’s time to tell you why Charlee is scared of St. Patrick’s Day! Last year in the Pre-K room we had a cute little Leprechaun that hung out in the classroom. Every morning the little guy was sitting on the shelf where we had left him but somewhere in the room, he had caused mass chaos. One morning he even turned all of the children’s chairs upside down!! All the children in the class thought this was the funniest thing, except for my little Charlee Ann. She was terrified! The little stuffed Leprechaun was alive as far as she was concerned…. She was totally not into it!! I had to cave and tell her that mommy was the one doing all the tricks!! Seriously….. she took all the fun out of it! I had to tell her the truth right?? Looking for more St. Patrick’s Day Resources? ?